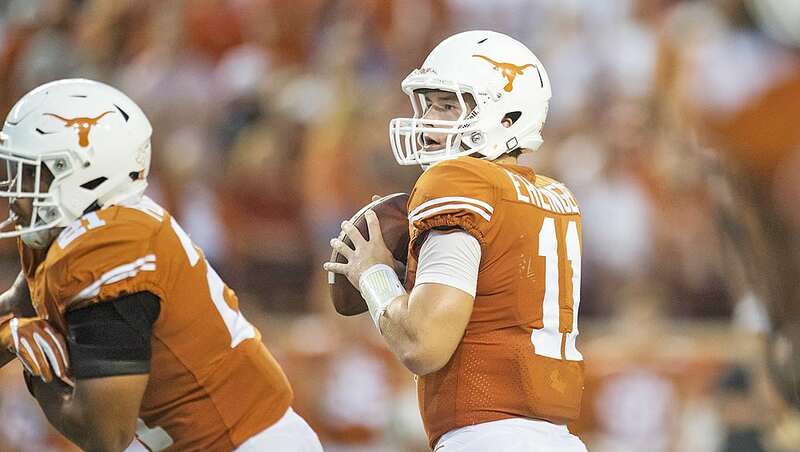 Quarterback Sam Ehlinger ran for a touchdown and passed for two more to help lead the Texas football team to a 28-21 win over visiting Tulsa, evening UT's season record at 1-1 (photo courtesy of texassports.com). AUSTIN, Texas — It's no secret that winning is tough, and that there is plenty of pressure involved in playing football at the major-college level. These are two points that Texas football coach Tom Herman is quick to mention to the media in the run-ups and aftermaths of the Longhorns’ game each week. So there is a certain level of satisfaction right now in the Texas football offices about the Longhorns’ 28-21 victory Saturday over Tulsa before a crowd of 90,563 at Darrell K Royal-Texas Memorial Stadium. The Longhorns won, they made the plays on both sides of the ball in the fourth quarter when they absolutely had to, and there were no significant injuries during the game. Hey, and things can only get better from here, right? UT fans will have to hope so. “Anytime you win, we’re going to celebrate,” Herman said after the game. “Winning is hard — really, really hard. You know, we’re going to get everybody’s best shot. Texas quarterback Sam Ehlinger ran for a touchdown and passed for two more, and it was just enough for the Longhorns to outlast a Tulsa that gave Texas all it could handle. Ehlinger hit on 21 of 27 passes for 237 yards and ran for an additional 51 yards as the Longhorns improved to 1-1, but it was far from easy. The deciding possessions came in the fourth quarter, when the Longhorns — Texas led, 21-14, but in neutral after a good first half — drove 75 yards in 13 plays to a Ehlinger-to-Tre Watson 11-yard touchdown pass. After the Golden Hurricane responded with a 35-yard touchdown pass from quarterback Luke Skipper to wideout Keenen Johnson, Texas then ground out the final 4:53 of the game, running the ball on nine of its final 10 snaps, the final two of which were kneel-downs in the victory formation. UT receiver Lil’Jordan Humphrey hauled in seven passes for 109 yards to pace the nine players who caught throws for Texas in the win while Watson led the Longhorns in rushing with 74 yards on 18 carries. An interception by Texas freshman safety Caden Sterns on Tulsa’s first snap set up the Longhorns with a short field, and it took them only three plays to drive 47 yards to a 1-yard scoring run by Ehlinger. The touchdown was set up by a 36-yard pass from Ehlinger to Humphrey. Texas drove to the Tulsa 1-yard line in eight plays on its ensuing possession but failed on third and fourth down on a bootleg run and a running-left-pass by Ehlinger, respectively, dooming the Longhorns’ scoring chance. Keaontay Ingram’s 29-yard touchdown, on which he cut to his left in the hole and then shook off a tackler before turning on the jets, punctuated the Longhorns’ third possession and granted Texas a 14-0 lead with 1:24 to play in the first quarter. Ehlinger went back to Humphrey late in the second quarter for a 40-yard scoring pass. The junior wideout hauled in Ehlinger’s throw at the Tulsa 20, juked under a tackle by Keanu Hill and shrugged off a high clutch by Grant Sawyer before strolling into the end zone to push the Longhorns’ advantage to 21-0. The Golden Hurricane did a lot of things right in the first half — Tulsa blocked a punt, moved the ball reasonably and had a goal-line stand — but had nothing to show its effort, thanks to three missed field goals. Two of the misses, from 43 and 29 yards, were off the foot of Nate Walker with the third, from John Parker Romo, drifting wide right from 39 yards away. Tulsa got on the board late in the third quarter on a 4-yard touchdown run by running back Shamari Brooks at the end of a 33-yard drive after a 24-yard punt by the Longhorns’ Ryan Bujcevski. The Golden Hurricane’s scoring march was nearly ended by a vicious-but-legal hit by the Longhorns’ P.J. Locke III on running back Corey Taylor III that separated Taylor from the ball. But he somehow recovered his own fumble, and three plays later Skipper scrambled around left end on fourth down to keep the drive alive. Tulsa then pulled to within 21-14 on a Brooks 1-yard touchdown run with 12:38 to play. The score was precipitated by a 48-yard bomb from Skipper to wide receiver Keylon Stokes to the Texas 1. After doing next to nothing on their first four drives of the second half, the Longhorns added an insurance touchdown with 6:25 to play as Ehlinger hit Watson for what proved to be the game-winning score. Skipper brought the Golden Hurricane right back down the field, finding time in the pocket and space deep and near the left sideline for a 35-yard touchdown pass to Keenan Johnson that cut the Longhorns’ lead back to seven points. Skipper threw for 153 yards and his one touchdown and was intercepted twice. Brooks led the Golden Hurricane rushing attack with 66 yards on 22 totes. Texas remains in Austin next week when it hosts USC at 7 p.m. (central time) in a game that can be seen on Fox.